A sale on Eurostar tickets last January meant that a good thirty of us all rather excitedly decided we should take advantage of our being only 10 minutes away from St Pancras and go to Paris. When it came round to it, only five of us actually followed through on it, booking our tickets for a weekend in March. We were excited, but slightly apprehensive (or I was at least) – we all knew each other from halls, but we didn’t know each other all that well, and we were about to spend three days stuck in a four man hostel room together. It could very easily have gone very wrong, which is a hard concept to grapple with now because in reality, it went really quite well. The four people I shared that tiny room with became the four people I live with now, because we had so much fun on that trip that we couldn’t imagine living any other way. As a result, there are so many pictures I could’ve chosen from that weekend to write about here – one of my pals dancing in the street next to Shakespeare & Co, one of Beth and I, dressed as a sassy lesbian couple (to try and get into a sassy gay club) standing triumphantly under the Arc de Triomphe at midnight before being chased away by French police, one of our super cute picnic under the Eiffel Tower – but I’ve chosen this one, from our last night, instead. We’d booked our ticket back to London for stupid o’clock on Monday morning, but could only afford two nights in a hostel as opposed to three, and so, broke and impressively optimistic, we decided to just stay up all night on Sunday. With no money or desire to go clubbing until getting on the train, we decided instead to rent Velos and cycle from wherever we were in East Paris to the Louvre. I was absolutely petrified, because – big moment here – I can’t ride a bike. I was definitely taught, but, contrary to popular belief, I forgot how to do it, and riding around the dingy parts of Paris at 1am was my first time on a bike in living memory. I was utterly convinced I’d fall off to my death, but by some miracle, after a brief bicycle 101 and a few faulty starts, I managed to keep up with my friends as we got utterly lost and saw several Parisian prostitutes (but didn’t reach the Louvre). 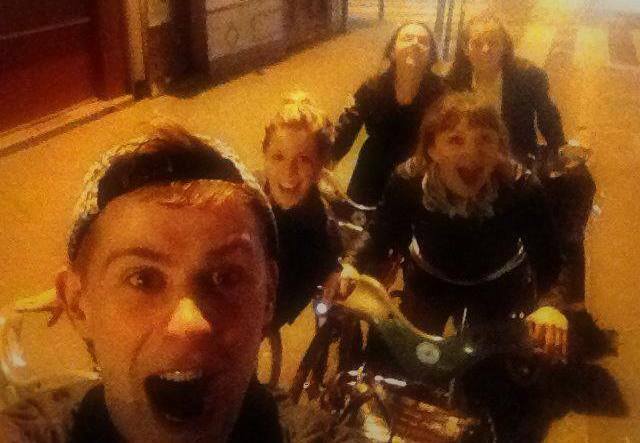 After putting the bikes away, we roamed around singing Fall Out Boy and that song from Anastasia about Paris at the top of our voices (embarrassing), before returning to the hostel to get half an hour’s sleep in the lobby before catching our train (necessary). I got back to London and went straight to my 10am lecture, which meant that my night ride around Paris felt like a very weird dream. Which it kind of was, really, because I haven’t been able to ride a bike since. It must’ve just been a Paris thing. I read this article and found it very interesting, thought it might be something for you. The article is called Paris, Bike Ride, 1am – #photographicmemory and is located at http://prancingthroughlife.com/2015/02/23/paris-bike-ride-1am-photographicmemory/.